House districts that voted in special elections during the Obama presidency, for example, voted pretty much as you’d expect — blue districts didn’t magically turn red, red districts didn’t magically turn blue. 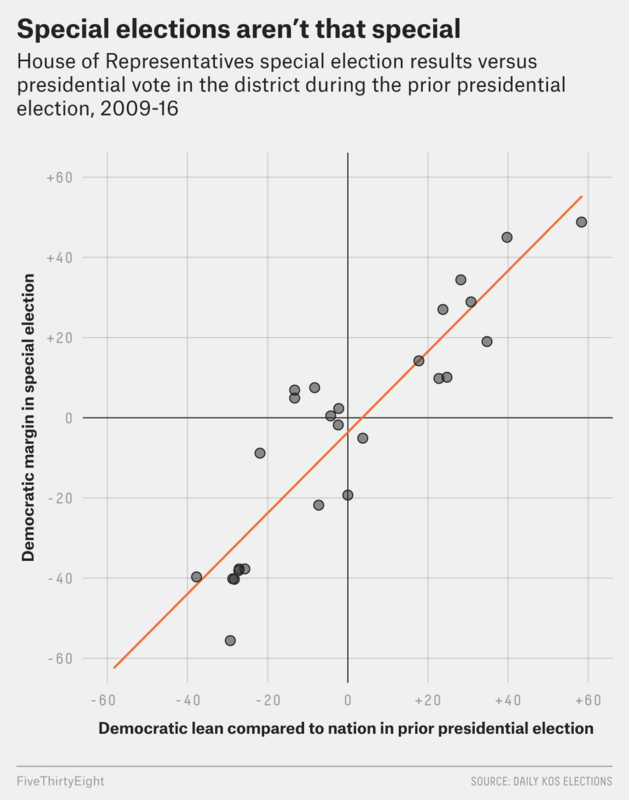 In the 26 special elections2 held during former President Barack Obama’s two terms, the average result mirrored the previous presidential vote in that district, but with the president’s party (Democrats in this case) doing a little worse3 than you’d expect in a neutral environment.4 That’s not surprising: The president’s party traditionally loses support between presidential and midterm elections, as Obama’s Democrats did between 2008 and 2010, and between 2012 and 2014. The relationship between the previous presidential vote in the district and how well the president’s party’s House candidate did in the special election did seem to depend, however, on the president’s popularity at the moment the election was held. When Obama was more popular, Democratic House candidates did a bit better; when he was less popular, they did worse. If that pattern holds under Trump, Republican candidates may, on average, do worse than Trump did in the districts holding special elections. So far, more people disapprove of Trump’s job performance than approve. The good news for Republicans is that most of the districts with upcoming elections weren’t at all competitive in 2016. Moreover, the trend seen during the Obama administration didn’t apply in every election. There were a few instances of Democrats doing better than the previous presidential vote would imply, even when Obama wasn’t popular.5 How much better or worse Republicans do than we would expect based on Trump’s popularity will at least partially depend on the Democratic and Republican candidates running. So far, Republicans appear to have recruited higher-quality candidates in most of these districts. If there is one special election to watch, it’s this one in the Atlanta suburbs. Republican Tom Price (now Trump’s secretary of health and human services) easily won this district in 2016. But Trump barely carried it in the 2016 general election and lost it in the Georgia GOP primary to Marco Rubio (despite carrying the state going away). Trump struggled largely because the district is highly educated — 60 percent of people 25 or older in the district have a college degree, compared with just 31 percent nationally. Mitt Romney won this district by over 20 percentage points in 2012, but Trump underperformed across the country with college-educated voters compared to previous Republican nominees. The special election in Georgia’s 6th district could be our first real test of whether Democrats can make inroads into traditionally red districts that were wary of Trump. All the Democrats and Republicans will run in one primary, and the top two finishers — regardless of party — will advance to a runoff election. (If no candidate hits 50 percent in the primary.) A number of formidable Republicans are running, including former secretary of state Karen Handel, former state Sen. Judson Hill, former state Sen. Dan Moody (who has the backing of former Georgia Gov. Sonny Perdue’s political machine), and former Trump diversity coalition leader Bruce LeVell. Democrats are rallying behind Jon Ossoff, who has been endorsed by the Daily Kos and local Democratic Reps. Hank Johnson and John Lewis. Ossoff still faces an uphill battle given the district’s traditional Republican lean. But this is the type of district where Democrats probably need to do well in 2018 if they have any chance of taking back the majority in the House. And it’ll be an early indicator of what effect the Trump presidency is having on down-ballot races. Rep. Zinke, who currently holds Montana’s one House seat, is likely to be confirmed as secretary of the interior. But he hasn’t yet, so no date has been set for the vote to replace him. That hasn’t stopped a bunch of Democrats and Republicans from throwing their hat into the ring, though. On the Democratic side, state Rep. Amanda Curtis, state Rep. Kelly McCarthy and singer-songwriter Rob Quist are all running, among others. On the Republican side, state Sen. Ed Buttrey, high-tech entrepreneur Greg Gianforte and state Rep. Carl Glimm, among others, have all declared their candidacies. Both parties will select their candidates through nominating conventions. While no clear favorite on the Democratic side has emerged, Gianforte is seen as the favorite among Republicans. Democrats have won a number of statewide races in Montana recently, including the governorship last year. They have a chance of winning this seat. But Gianforte would be a strong favorite. Montana is really red, after all. The suspense in this Republican-leaning district evaporated the minute Republicans selected State Treasurer Ron Estes as their candidate to replace Mike Pompeo, recently sworn in as Trump’s CIA director. In a nominating convention this month, Estes, the choice of the establishment, easily beat back challenges from Todd Tiahrt, who used to represent the district, and former Trump advisor Alan Cobb. Democrats are hoping that their candidate, attorney James Thompson, can pull off the upset by linking Estes to unpopular Republican Gov. Sam Brownback. Even if Thompson is able to do that, however, it’s going to be extremely difficult to win in a district that no Republican congressional candidate has won by less than 20 percentage points since 2002. Democrats can probably consider it a victory of sorts if Thompson loses by less than 20 percentage points. Mulvaney was just confirmed to be Trump’s Office of Management and Budget director, so some unexpected candidates may decide to run at the last minute. Still, any chance Democrats had of winning this race probably ended when state Sen. Vincent Sheheen decided not to run. Indeed, no prominent Democrat has declared for the seat, though Democrats hope State Rep. Mandy Powers Norrell runs. Republicans, meanwhile, have a host of candidates who are interested in the job, including former state chair, Chad Connelly, State Guard Cmdr. Tom Mullikin, state House Rep. Ralph Norman and House Speaker pro tempore Tommy Pope (again, among others). The top two finishers in the Republican primary will face each other in a runoff if the winner receives less than 50 percent of the vote. The only real question in this heavily Latino district covering Los Angeles is which Democrat will succeed Becerra, now California’s attorney general. Twenty-three candidates have filed to run. If no candidate gets at least 50 percent on April 4, the top two candidates will face off on June 6. The leading candidate seems to be Democratic Assemblyman Jimmy Gomez, who has raised the most money and attracted the most establishment support. Other candidates to keep an eye on include Democrats Sara Hernandez and former Bernie Sanders staffer Arturo Carmona. Still, special elections in California historically have very low turnout, which could lead to some wacky results. That doesn’t mean the results in special elections are predictive of the upcoming midterm elections in 2018. In fact, special elections tend not to be all that predictive of the next cycle, but we’ll have more on that in a separate article. We’re looking only at special elections that occurred outside of the traditional November day when all House seats are up for a vote. (That excludes 11 that took place along with all the other races.) Further, we’re only looking at elections in which at least one Democrat and one Republican were still running by the time the vote was held. (That excludes a race in Georgia in 2010 in which the sole Democrat withdrew before the vote.) For elections where more than one candidate appeared on the ballot from the same major party, I’ve combined the totals of the different candidates for a single vote percentage for a party. The Democratic candidate’s margin was about 4 percentage points worse, on average. If Democrats and Republicans were tied nationally in the presidential vote. For example: Democrat Katherine Clark defeated Republican Frank Addivinola by more than 30 percentage points in the 2013 Massachusetts 5th special election, a much wider margin than expected.